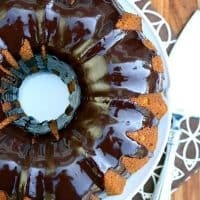 PUMPKIN CHOCOLATE SWIRL BUNDT CAKE — A moist, flavorful pumpkin bundt cake with a chocolate swirl and chocolate ganache glaze. If there’s anything I love more than pumpkin, it’s pumpkin and chocolate. It’s such a great flavor combo! 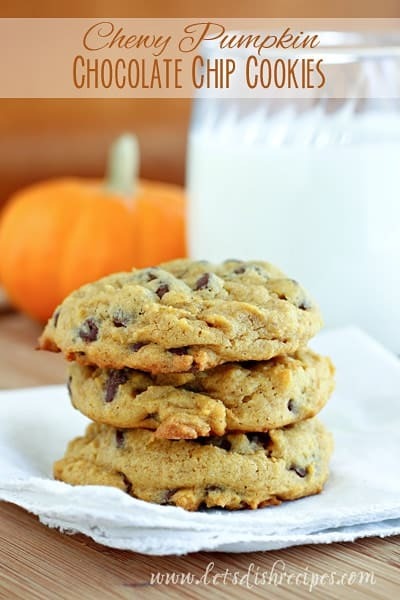 If you’ve ever had a pumpkin chocolate chip cookie, you know what I mean. 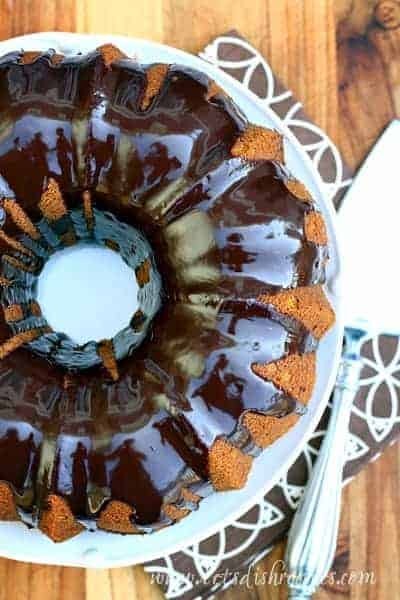 And this Pumpkin Chocolate Swirl Bundt Cake, with a beautiful chocolate ganache glaze, is an impressive way to bring chocolate and pumpkin together. Everything about this cake says “welcome fall,” from the colors to the flavors, to the way your kitchen smells while it’s baking. And with that beautiful chocolate swirl, this cake is fancy enough to accompany a holiday dinner. But it’s not that hard to make! 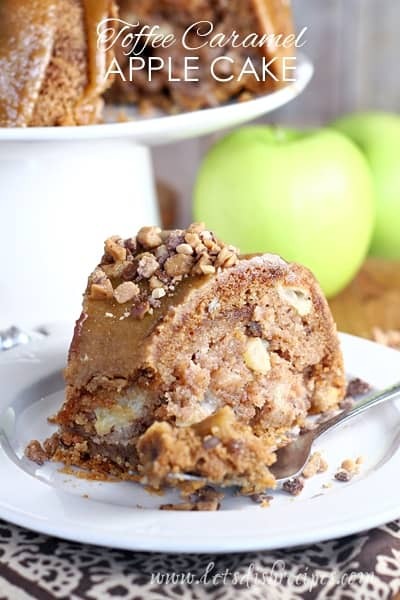 The recipe starts with one simple batter–you add pumpkin and spices to some of the batter, and add cocoa powder to the rest, then swirl everything together in your bundt pan. The result is a dessert that’s both pretty and delicious. And the chocolate ganache is literally the icing on the cake! Because bundt cakes tend to serve a lot of people, this is a great dessert for feeding a crowd, or bringing to a fall potluck. If you’ve never made ganache before, don’t worry. It’s easy too! Once you know how, you’ll be topping everything with this thick chocolate glaze. You’ll need a bundt pan with at least a 10 cup capacity to make this cake. I always use Baker’s Joy cooking spray when I’m baking something that needs to come out of the pan easily. I highly recommend a generous coating. You can also prepare your pan using the traditional grease and flour method. I served this cake while my parents were visiting, and they loved it, along with the rest of my family. 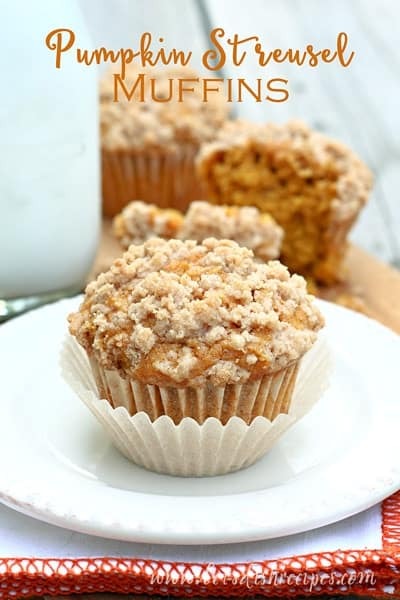 It’s wonderful with a scoop of vanilla ice cream or a dollop of whipped cream. I may have even had a slice or two for breakfast! Be sure to save this Pumpkin Chocolate Swirl Bundt Cake recipe to your favorite Pinterest board for later. 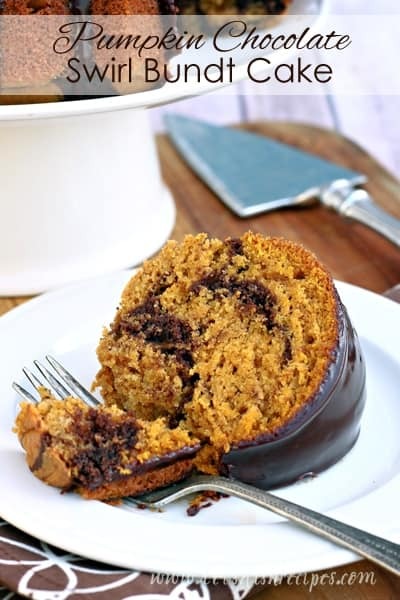 A moist, flavorful pumpkin bundt cake with a chocolate swirl and chocolate ganache glaze. Preheat oven to 300 degrees. Generously grease and flour a 10-15 cup bundt pan. In a large bowl, beat the butter and brown sugar until fluffy. Add eggs, one at a time, beating well after each addition. In a medium bowl, whisk together the flour, baking powder, baking soda, and salt. Gradually add flour mixture to butter mixture. Beat in the sour cream and vanilla. Spoon 1 cup of the batter into a medium bowl and set aside. Add pumpkin and pumpkin pie spice to the remaining batter and beat until combined. Add buttermilk and cocoa powder to the reserved cup of batter and whisk until combined. Spoon 1/3 of the pumpkin batter into the prepared pan. Spoon half of the chocolate batter over the pumpkin batter. Repeat once, then spread the remaining pumpkin batter on top. Gently swirl the batters together with a knife. Tap the pan on the counter a few times to release any air bubbles. Bake for 55-60 minutes, or until a wooden pick comes out clean. Let cool in pan for 10 minutes before turning onto a wire rack to cool completely. While cake cools, make the ganache: heat the cream in a small saucepan over medium heat until it just starts to foam around the edges. Do not let it boil. Remove from heat and add the chopped chocolate. Let stand 2-3 minutes, then whisk until the chocolate is smooth and shiny. Let stand until ganache is cooled, but still pourable. Place the cake on a wire rack, then place the rack over waxed paper. Spoon the ganache over the cake. Allow the ganache to set before slicing and serving.